Most folks here in the West Palm area have seen squirrels around the neighborhood or park as they scurry about, exploring trees, running across the road, and unfortunately sometimes in our homes. These critters love to take advantage of the warm, secluded, safe habitat that our attics, sheds, and garages provide them. They need a protected area to safely raise their newborn babies, and a home gives the protection from rain, wind, and predators that they want. Squirrels are small creatures, and the openings they can squeeze through are even smaller. Once inside your home, these critters may build a nest using your attic insulation, or attempt to leave for food and become trapped. When this happens, they will do anything to get free, including chewing holes in your walls, eaves, or soffits. When they decide to nest in your home, they will stay as long as they are able to, damaging and soiling your home the entire time. Squirrel invasions are a common issue for West Palm citizens year-round, thanks in part to the intense climate here in Florida. Because of this close interaction, squirrels have become almost reliant on humans for shelter and food in some cases. In West Palm, as with many other areas, squirrels have lost much of their natural fear of humans because of our close interactivity. This, combined with the number of people who feed squirrels both intentionally and unintentionally makes it easy to see why squirrel invasions have become so common. With so many issues involving squirrels, it seems difficult to imagine that they do much good, but they are actually very beneficial to the environment. They are fantastic at eating damaging insects like beetles and grubs, protecting your landscaping and vegetable gardens. However, this doesn’t mean they should be kept as household pets. They can inflict serious injury and even transmit disease. 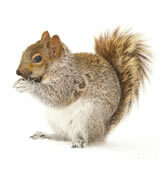 When squirrels cross that line from helpful critter to home invader, give Critter Control® of West Palm a call. Our wildlife removal technicians are able to safely and efficiently remove the nuisance critters. Call us today at 561-274-0224 with any questions, or to schedule a free home consultation.